Bond Economics: Comments On "Deflating Inflation Expectations"
Comments On "Deflating Inflation Expectations"
On March 3rd, Stephen G. Cecchetti, Michael E. Feroli, Peter Hooper, Anil K Kashyap, and Kermit L. Schoenholtz presented the paper "Deflating Inflation Expectations: The Implications of Inflation’s Simple Dynamics" to the 2017 U.S. Monetary Policy Forum. I had read comments about the paper elsewhere, and the key takeaway of my comments here is that such external commentary had no relationship to the analytical content of the paper. My feeling is that the paper's analytical content is not telling us anything new; whether the Cecchetti et al. 's verbal conclusions are useful are left for the reader to decide. This paper is an example of empirical economics, which is allegedly under a revival within mainstream economics. The problem with empirical analysis in the absence of theory is that the researchers just end up ignoring hidden theoretical assumptions. My feeling is that the preaence of such hidden assumptions is the key flaw of the paper in question, which is why I am not going to spend a great deal of the reader's time dissecting the analysis. One of the amusing things about discussions of economics is that analogies to physics are continuously invoked -- but never when they might be useful. In the current case, we have a wonderful analogy to use. Imagine that you are a physicist in a strange alternative timeline where you have access to modern measuring equipment and digital storage technology, but somehow had no theory of gravitation. less than a minute of noisy data of the two rocks falling from various heights? If you blindly followed the types of statistical analysis used by economists in journal articles, you would prefer #1, since you have a greater sample size. Needless to say, that's the wrong answer. This is where theoretical assumptions kick in. If you believe that the economy is characterised by a few deep structural parameters, is normally near equilibrium, but is continuously buffeted by random shocks, a longer run of data is generally better. If you believe that the economy can reach a steady state, but that steady state is affected by institutional changes within the economy, you have to expect that there will be periods when having a longer run of data is essentially useless. Like the rocks sitting on the ground, you can draw limited conclusions from steady state behaviour. If you look at the verbal discussion within "Deflating Inflation Expectations," the authors are aware of the issues I am discussing here. For a somewhat inexplicable reason, they chose the post-1984 period to do their analysis (the period after the vertical line in that chart at the top of this article). Their argument is that this post-1984 analysis tells us something about central bank policy in the post-1984 period -- because they assume that inflation is mainly the outcome of central bank policy. My argument is that they chose a sample period that was obviously a form of steady state, and so they have no ability to draw any conclusions from their statistical analysis; for all intents and purposes, they have one data point to work with. The best summary of their statistical analysis is as follows. Since 1984 in the United States, inflation has not moved a lot. 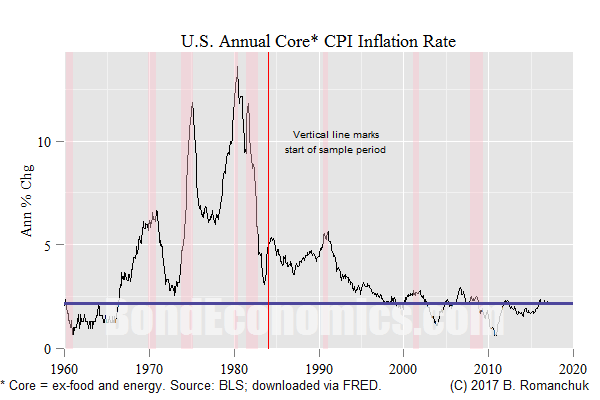 Since 1984 in the United States, inflation has tended to follow a trend; the current level of inflation is likely to be close to past levels of inflation. The only intellectually honest answer is to admit that all of this is consistent with inflation in the United States after 1984 is in some form of a steady state. Any number of theories can explain such an outcome, particularly when we keep in mind that factors unrelated to capacity pressures in the economic explain much of the residual volatility in post-1990 measured inflation. I can project my own intellectual biases onto that evidence; Cecchetti et al. do their own. If the reader wishes, they can read the paper, and see if their biases matches your own. I want to underline that the distinction I draw between the mathematical/statistical analysis and the verbal description of that analysis is not a feature that is peculiar to this paper: pretty much the entire modern mainstream macroeconomic literature features such divergences. However, when reading commentary on the paper, I saw two obviously wrong theories being projected onto the paper's results by other people. "Inflation expectations" have no effect on inflation. Labour market conditions have no effect on inflation. Inflation expectations are a big deal in modern economic theory. Modern mainstream macro has devolved into imputing everything onto expectations. It has reached the point that we have academics suggesting the central bank can set nominal GDP to whatever level it desires, solely through a triumph of the will (and they are taken semi-seriously). This has created some controversy around the subject, which I am going to ignore here. When discussing inflation expectations, we have to distinguish two very different concepts. Do particular measured time series (either surveys, or inferences from inflation-linked fixed income markets), which we often label "inflation expectations", have any predictive power? Does the theoretical concept of "inflation expectations" matter? For the first concept, the paper "Deflating Inflation Expectations" discusses various surveys, and does the empirical analysis. I will let the reader draw their own conclusions. My bias is to not put too much faith in these measured series. There are three main types of such series, derived from the bond market, and surveys of economists and consumers. Inflation expectations derived from the bond market are generally only available during the flatflation era (post-1990s). (The exception is the United Kingdom.) However, since my objective at my previous job was to determine where these expectations should be, I have always looked at these series differently than central bank economists (who are only interested in drawing information from them). If economists believe that inflation expectations determine inflation, how can they answer the inflation survey question themselves? Consumer surveys theoretically make more sense, but I would argue that there have been important institutional shifts. Inflation psychology has died, and most people spend little time thinking clearly about the subject. Seriously, the only non-economists on the internet who discuss inflation are those who believe that it is really 8%, and the BLS is lying to everyone. In summary, we will only get some useful empirical insights when we break out of the low inflation regime. Turning to the theoretical concept of inflation expectations, I would argue that it is obviously important. However, we need to look at hidden assumptions. If you assume flexible prices, it is entirely reasonable to pretend that the price setting process is somehow magical, and we need to come up with mysterious econometric procedures to determine it. However, in the real world, most prices are administered. The administrators may be literally governmental administrators, or they may be bureaucrats within some firm. In particular, almost everything in the Consumer Price Index is the result of administered prices; the important exception being gasoline prices (which is a major source of CPI volatility). If an inflation psychology is entrenched, prices will be automatically indexed. In the worst case, prices are indexed to a foreign currency, and a hyperinflation results as the local currency value goes to zero versus other currencies. Absent indexation (which describes the post-1984 period analysed by the paper), administrators want to set prices for a period of time. A typical pattern is for prices to be fixed, and then jump by 5%. That is, most price changes will be nil, and the observed rate of inflation is the result of the proportion of prices that in fact jumped. Furthermore, they set prices as a markup over costs. Therefore, if they expect their input costs to rise over the coming period, they raise their prices more than if they expect input prices to be flat. Therefore, the correct answer to the empirical questions about inflation expectations is as follows. To what extent surveys do not work, that is the result of the survey being of the wrong people. Unfortunately, there is no reason to believe that a good survey could be constructed. I do not want to dredge up the dreaded NAIRU debate, but the analytical conclusions of the paper say that it is a useless concept. The paper looked at the unemployment gap -- the difference between the unemployment rate and a specific time series that is labelled NAIRU. There was a correlation between the unemployment gap and inflation; but the measured effect was smaller than the monthly measurement error on inflation. This should be obvious: a cyclical economic series is correlated to "the cycle" by definition, and hence, any two cyclical series are likely to have some form of correlation. The question that matters: can we use this correlation to make predictions? In the case of the unemployment gap, saying that a deviation of the unemployment rate from some arbitrary time series will cause inflation to move by a number less than 0.1% is pretty much the same thing as saying that the measured level of the unemployment rate has no measurable effect on inflation. Furthermore, the test is polluted, since the definition of NAIRU that is used was backfit to get a desired statistical relationship between it and inflation in the early part of the sample period. The only intellectually honest analysis is that we have not found a methodology that generates an "unemployment gap" that has any useful predictive properties. Believing that a NAIRU exists is pretty much as useful as believing in Santa Claus: perhaps he exists, we just can't prove it. However, we cannot jump from the failure of NAIRU to saying that "labour market tightness has no effect on inflation." Think about the following thought experiment. Assume that someone other than the Republican and Democratic candidates won the U.S. election in November, similarly for Congress. This new government raised the nationwide minimum wage to $20. This minimum wage is going to be aggressively indexed: it will rise at CPI+2%. This minimum wage is enforced effectively. Nobody in their right mind would expect anything other than a fairly hefty inflation. The indexation would ensure that any one-time price level shocks would be perpetuated. In other words, we cannot infer anything about data from 1984-2017 to say anything about the labout market and inflation. There are any number of theories that can explain the results of the paper in question. We can only distinguish the validity of those theories by moving to a period of more volatile inflation. More generally, this paper reinforces my views about how we should approach economic analysis. We need to keep theoretical assumptions in mind when looking at empirical work. Furthermore, we need to draw a very strong distinction between an empirical analysis within a paper, and what the paper's authors say the implications are. * There is a technical niggle about my discussion of inflation and markups. In theory, we could have inflation in a cost-markup model as a result of rising profit margins (markups over expected cost). In practice, such an effect is not going to be sustained for very long. "The problem with empirical analysis in the absence of theory is that the researchers just end up ignoring hidden theoretical assumptions. " And they are working with date which, by definition, has been collected under the influence of policies they have created. Analysis of a man in a straitjacket won't tell you anything much about taking off the straitjacket.